Printable Fraction Worksheets Your Students Will Enjoy Because These Are Fun. Check out printable fraction worksheets that will help students become fraction masters. Putting the Fun in Fraction Worksheets! You'll find fractions for all grade levels. And we'll be adding more soon, so check back often for new stuff! Contact us to let us know what kind of fraction worksheets you would like. So for starters, take a look at this beginning level fraction fun sheet. In this fraction activity, students will get to color fraction circles with different colored pencils and name the fraction part of each color. 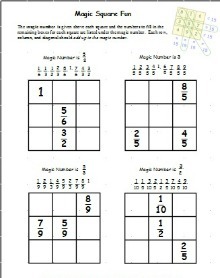 All kids and adults for that matter, should experience the fun of magic squares! Here's our first fraction magic square worksheet we think your students will really enjoy. Students need to use math thinking skills to be able to solve these fraction magic squares and build their skills adding fractions like and unlike denominators. Check out the printable sheets below. I've listed the fraction skill for each worksheet. Many more worksheets to come. You might also like some of the free printable fraction games on the site that I've listed below. 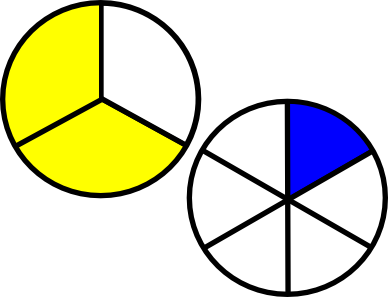 You can also find more fraction games and resources on the main fractions game page. Many young people struggle with fractions. It shouldn't be that way. I will continue adding fraction resources to the site that will help kids become fraction masters! Greg, The Math Games Guy.